Every child has the power in them to achieve great things. Join our petition asking the World Bank to support renewable energy which tackles poverty. CAFOD’s latest resources for university students and young adult communities. 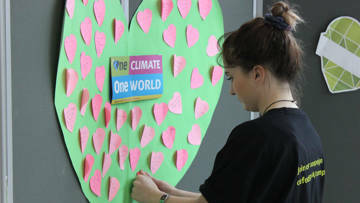 CAFOD is working to develop a new dialogue with university chaplaincy and young adult communities in England and Wales; to connect your community with our network of sisters and brothers around the world; and to share with you our resources. We’re inviting chaplaincy communities across England and Wales to join us in engaging with Pope Francis’ challenge, set out in Laudato Si’; to find a new way of living together, in our common home, by responding to the cry of the earth and the cry of the poor. Below you’ll find a calendar of upcoming CAFOD activities and events, all supported with accessible and timely resources. Please contact Lucy Jardine if you would like any more information or resources, if you’d like someone to visit your community, or if you have any input or feedback. The Power to be campaign has finished, but you can continue taking action on renewable energy. A calendar of upcoming CAFOD activities and events, all supported with accessible and timely resources. Check out the many opportunities to get involved with CAFOD this year. 16 million people across East Africa are facing starvation and need urgent help. Please donate today and provide food and water to those in need.